You are here: Home / Investors / Stock Analysts / Ashland (ASH) Up 15% in a Year: What’s Working in Favor? Ashland (ASH) Up 15% in a Year: What’s Working in Favor? Shares of Ashland Global Holdings Inc. ASH have popped around 15% over a year. The company has also significantly outperformed its industry’s decline of 5% to over the same time frame. Ashland, a Zacks Rank #3 (Hold) stock, has a market cap of roughly $5.1 billion. Average volume of shares traded in the last three months was around 585.6K. Ashland has an expected long-term earnings per share growth rate of 10%. Let’s take a look into the factors that are driving this specialty chemical company. 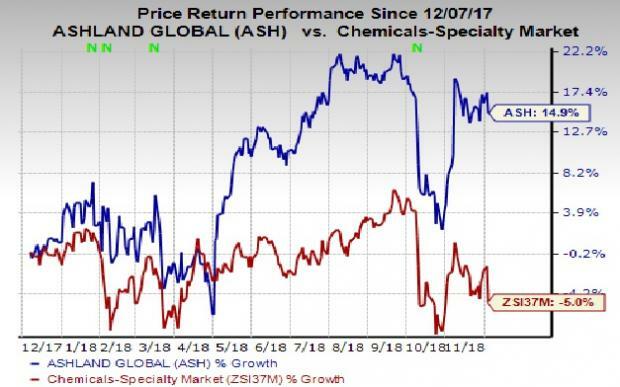 Ashland is benefiting from strong operational performance and appropriate pricing actions in response to raw material cost inflation. The company is also gaining from actions to grow its premium mix, its focus on improving asset utilization and cost management. All these contributed to a strong growth in its adjusted EBITDA margins in fiscal 2018. The company, earlier this year, announced a program to eliminate $120 million of existing corporate and Specialty Ingredients unit’s selling, general and administrative (SG&A) costs as well as manufacturing facility-related expenses. The company has already captured $20 million in run-rate saving at the end of September 2018 and expects to achieve the $120 million of total run rate savings by the end of calendar year 2019. Ashland also expects to generate roughly $230 million in free cash flow in fiscal 2019. Ashland, last month, also agreed to sale its Composites unit and the butanediol (“BDO”) manufacturing facility in Marl, Germany, to London-based INEOS Enterprises in a deal worth around $1.1 billion. The transaction is expected to close before the end of the June 2019 quarter. The sale of these businesses is in sync with Ashland’s goal of having a more streamlined and focused product portfolio that will reduce earnings volatility and improve margins. The move will allow the company to focus on its portfolio of Specialty Ingredients. Ashland envisions net proceeds of around $1 billion from the divestitures and expects to use that proceeds primarily for debt reduction. Better-ranked stocks worth considering in the basic materials space include The Mosaic Company MOS, CF Industries Holdings, Inc. CF and Ingevity Corporation NGVT. Mosaic has expected long-term earnings growth rate of 7% and sports a Zacks Rank #1 (Strong Buy). Its shares have surged 48% in the past year. You can see the complete list of today’s Zacks #1 Rank stocks here. CF Industries has expected long-term earnings growth rate of 6% and carries a Zacks Rank #1. Its shares have gained 11% in a year. Ingevity has expected long-term earnings growth rate of 12% and carries a Zacks Rank #2 (Buy). Its shares have rallied 24% in a year.